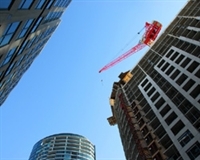 U.S. office construction has reached its highest level since 2008 as developers break ground on new projects in a growing number of markets where job growth, rising rents and falling vacancies are finally justifying new development. An analysis of CoStar Analytics data shows about 86 million square feet of higher-end office properties larger than 50,000 square feet under construction, a 25.7% increase compared to 2013's 68.5 million square feet and the highest total since the end of 2008, when 105.7 million square feet of new office space was under construction. This total amount under consturction for the year is likely to rise even higher as CoStar researchers discover more new projects breaking ground before the end of 2014. CoStar expects 44.5 million square feet of office project deliveries by the end of 2014 -- a 22% increase over 2013. New office construction starts, meanwhile, stood at 42.6 million square feet as of Sept. 30, already exceeding last year's total, ensuring a steady supply of new product through early 2017. "Developers are hustling now to get new product to the market, given the stronger absorption trends, particularly for newer, high-quality space," explained Cassidy Turley Chief Economist Kevin Thorpe. "But it will take a couple of years for all of this new development to materialize, meaning demand will continue to outstrip supply, which will keep upward pressure on rents." Editor's note: For a comprehensive look at the U.S. office market, register for the CoStar State of the Office Market Third-Quarter 2014 Review & Forecast on Oct. 21. CoStar subscribers may log on and click the Knowledge Center tab. John Sikaitis, managing director of U.S. office market research for JLL, believes that managing the development pipeline will become the biggest challenge for the office market, especially in hot construction markets like Texas and the San Francisco Bay Area. He points out that office development has shifted from being largely focused on build-to-suits to now primarily multi-tenant construction, which has lower 50% to 60% pre-leasing rates, versus a 100% pre-leasing rate on build-to-suit developments. While that signifies improving sentiment in both the office sector and the overall economy, it also foreshadows the oversupply issues from past cycles. "A lot of developers now are thinking about breaking ground on that next project, and we could be in that same exact situation 36 months from now that we were in during 2009 and 2010," Sikaitis said. "We really need to pause and think about the momentum in the market, and if it's sustainable with this new development." For now, analysts say, the good news is that strong leasing activity is more than offsetting concerns about potential oversupply. Only 45% of space under construction remains available, with large blocks taken by tech, creative and energy companies such as Salesforce.com, Comcast, ConocoPhillips, Google, State Farm and LinkedIn. Walter Page, CoStar Portfolio Strategy director of research, office, said the U.S. is on pace for office tenants to take 77 million square feet of office space in 2014 -- a 77% increase over 2013 -- followed by another 90 million square feet in 2015 and 2016. The vacancy rate will trend down to a projected low of about 11% in 2016 as shadow space evaporates and office job growth continues to rise. In the improving economy, even the rate of decline for average space per employee has slowed from 2% to 1%. "We have significant less supply than demand, which will allow vacancy rates to continue to move down until 2017," Page said. "The office market recovery is at its best point of the past seven or eight years. We experienced more occupancy gains in the third quarter than so far in the recovery," Sikaitis added. Preliminary CoStar data shows that net new office supply of 23.5 million square feet nearly caught up with demand of 24.9 million square feet in the third quarter. But that's not likely to last, with absorption expected to remain north of 30 million square feet per quarter through late 2016. By that time rent growth is expected to slow, as many of the new office developments now under construction enter the market, such as Hines' 48-story tower at 609 Main Street in Houston, Hanjin Group's 73-story, 1.7 million-square-foot Wilshire Grand Tower in downtown Los Angeles, and towers in North Riverside Plaza and 444 W. Lake Street in Chicago. Mid-size projects beginning in the current quarter and early 2015 will reach the market in late 2016 early 2017 at the same time. "We're going to see a pickup in construction, which will ultimately weigh on fundamentals," said CoStar Portfolio Strategy real estate economist Sam Tenenbaum. Tenenbaum recommends that investors start thinking about developing in secondary and tertiary markets such as Portland, Minneapolis, Denver and Nashville, where demand has been fairly strong, vacancies have tightened, and pricing has picked up substantially, especially for newer office buildings built since 2008. Ultimately, however, the usual host of economic wildcards will determine how much office space gets built. "Prevailing macroeconomic factors, lenders' willingness to start projects on a speculative basis, rising construction costs and the rise and fall of interest rates will determine how much of the pipeline will begin construction sooner rather than later," JLL's Sikaitis said.